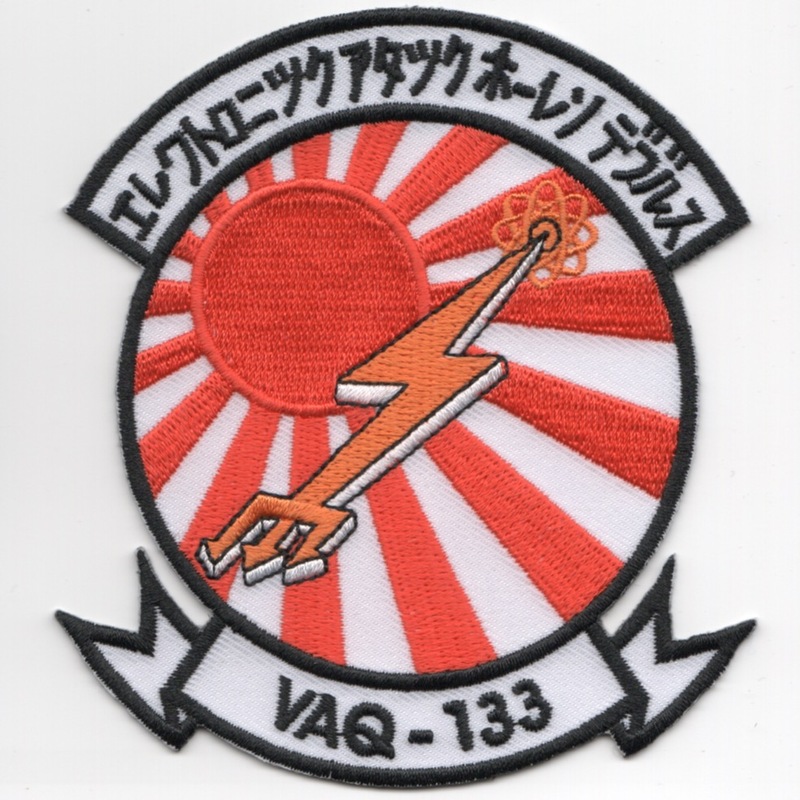 This is the old version of the disestablished squadron patch for VAQ-133 that flew the EA-6B Prowler out of NAS Whidbey Island, WA. They were decommissioned in June 1992. 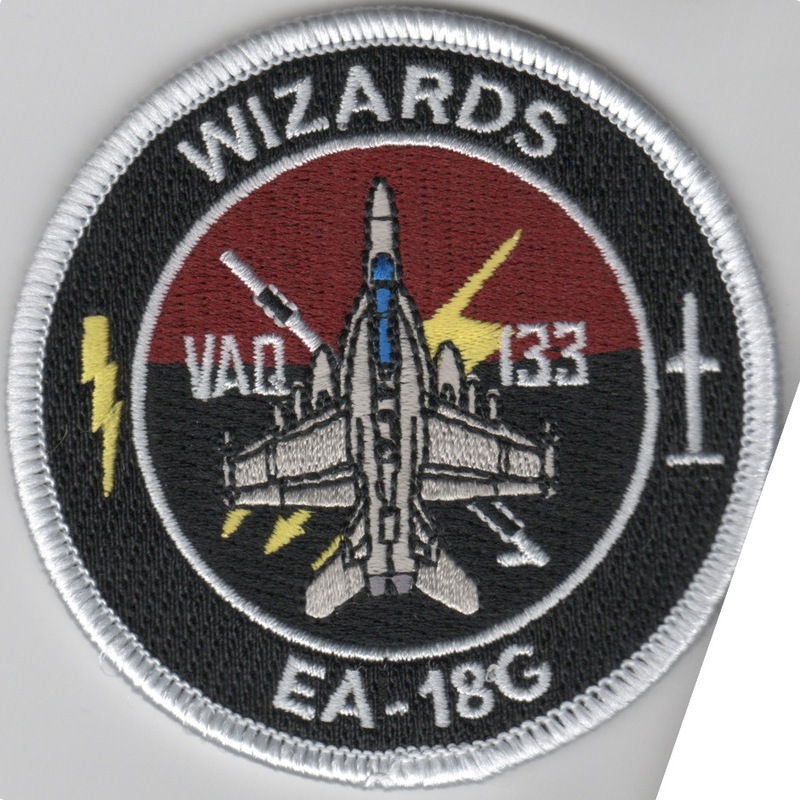 This is the color version of the newly re-established squadron patch for VAQ-133 that flies the EA-6B Prowler out of NAS Whidbey Island, WA. They were decommissioned in June 1992, recommissioned in 1996. This is the desert version of the newly re-established squadron patch for VAQ-133 that flies the EA-6B Prowler out of NAS Whidbey Island, WA. They were decommissioned in June 1992, recommissioned in 1996. 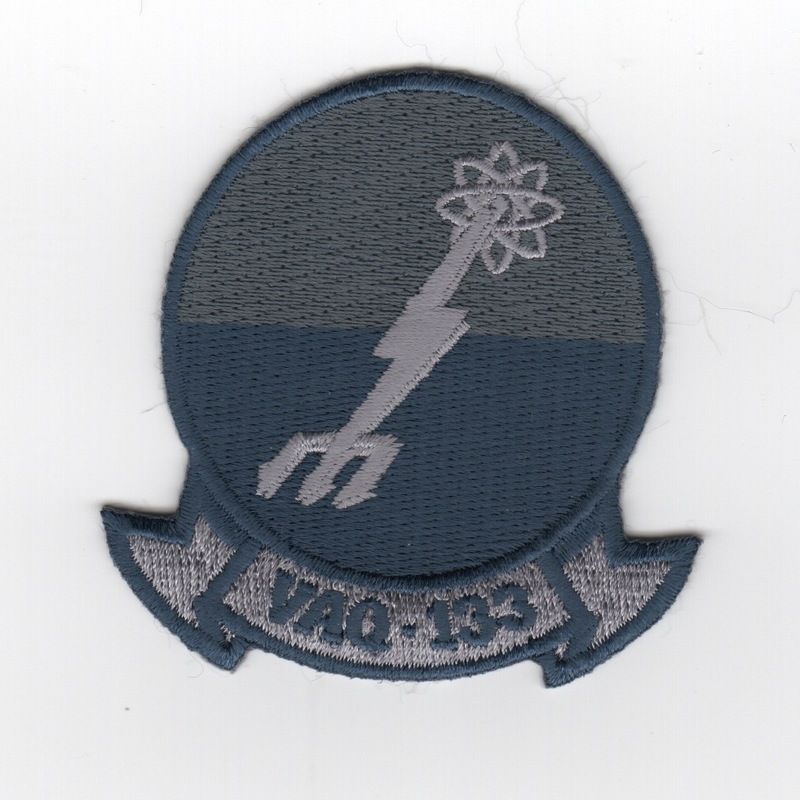 This is the small version of the aqua-colored version of the newly re-established squadron patch for VAQ-133 that flew the EA-6B Prowler out of NAS Whidbey Island, WA. They were decommissioned in June 1992, then recommissioned in 1996. They currently operate the F/A-18G "Growler". This is just in direct from the "WIZARDS" Coffee Mess. 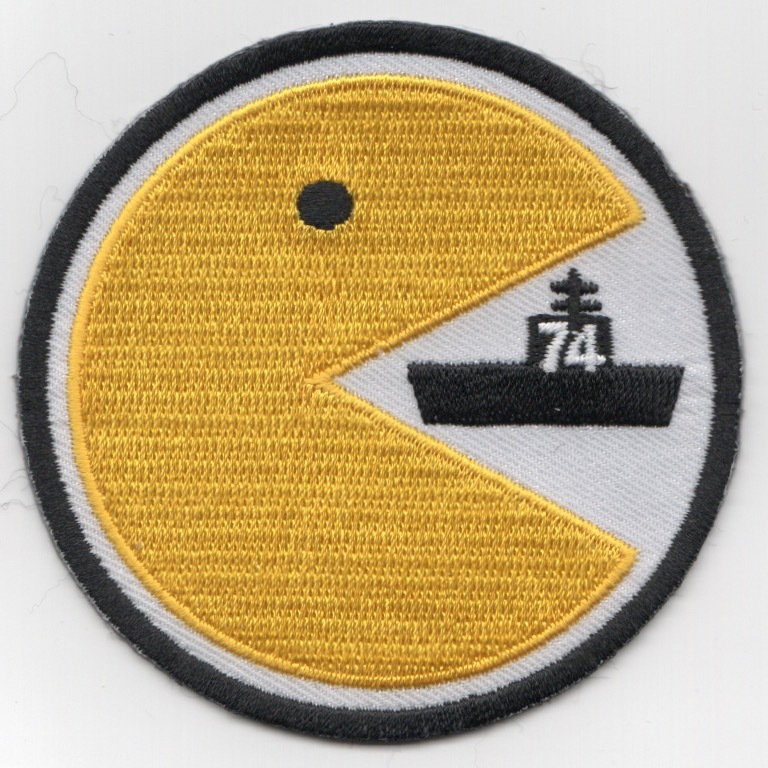 This is the 2018 'yellow' version of the 'PACMAN' cruise patch created for VAQ-132 and CVN-74. It shows the standard 'PACMAN' character getting ready to devour the CVN-74 (USS Stennis) aircraft carrier (not sure the message behind this one). This patch does not come with velcro attached. This patch was picked up from the squadron's supplier in Japan. It shows the "Grateful Dead" skull with the "Operation ENDURING FREEDOM" along the top and "TASK FORCE IRON" along the bottom with the dates "JUL 2004 - FEB 2005". This patch does not come with velcro and I only was able to get a few from their supplier. (Korean): This patch was picked up while on a trip to Korea. I found a little shop just outside the gate that had a few of these. Note it has the Japanese (or possibly Korean) script at the top with the squadron designator at the bottom. This patch does not come with velcro attached. This is the patch worn by the aviators in that squadron on their right flight suit and jacket sleeve for their participation in Operation Enduring Freedom. 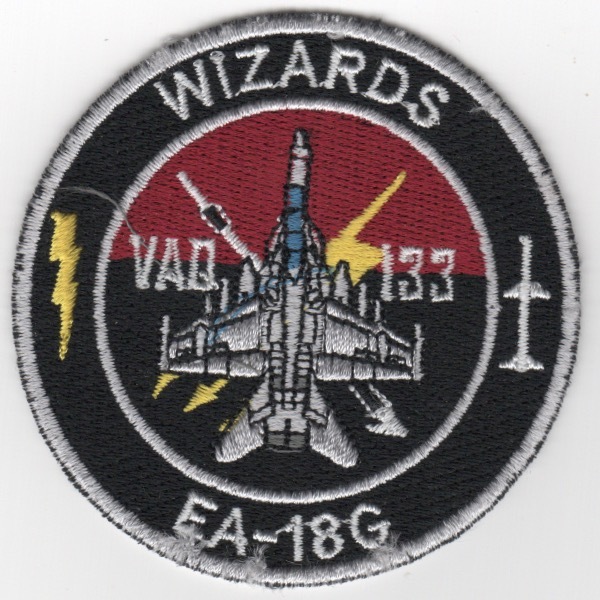 This is the White-Merrowed-Border version of the aircraft "bullet" patch for the VAQ-133 'WIZARDS' that fly the EA-18 'GROWLER' out of NAS Whidbey Island, WA. It does not have velcro attached. This is the White-Lasercut-Border version of the aircraft "bullet" patch for the VAQ-133 'WIZARDS' that fly the EA-18 'GROWLER' out of NAS Whidbey Island, WA. This was found in a small Korean embroidery shop and has the "theater-made" feel to it. It does not have velcro attached. 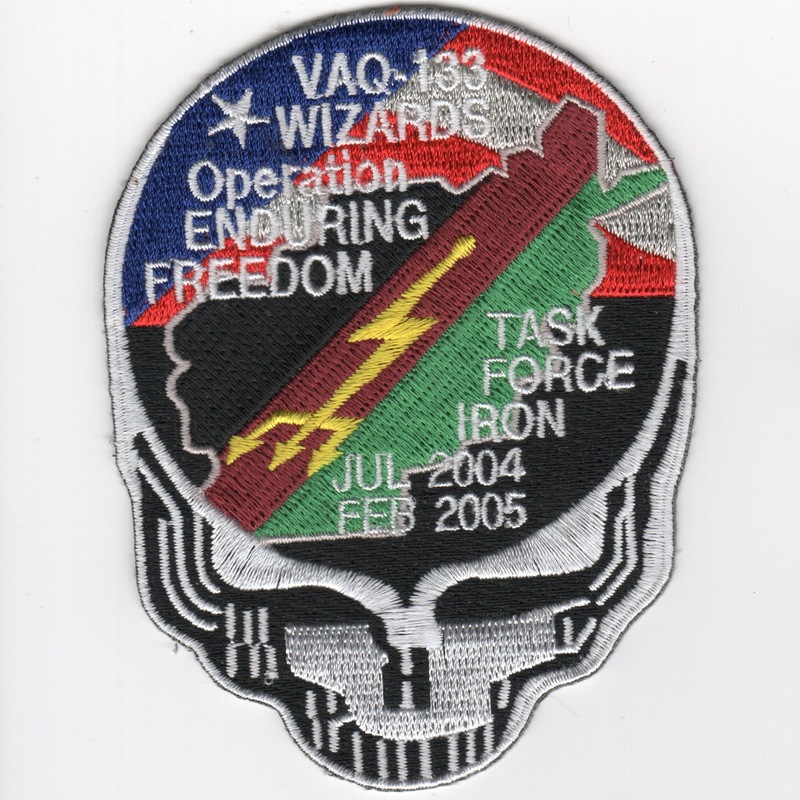 This patch was created for the last crew (of four) that flew out of Afghanistan for VAQ-133. 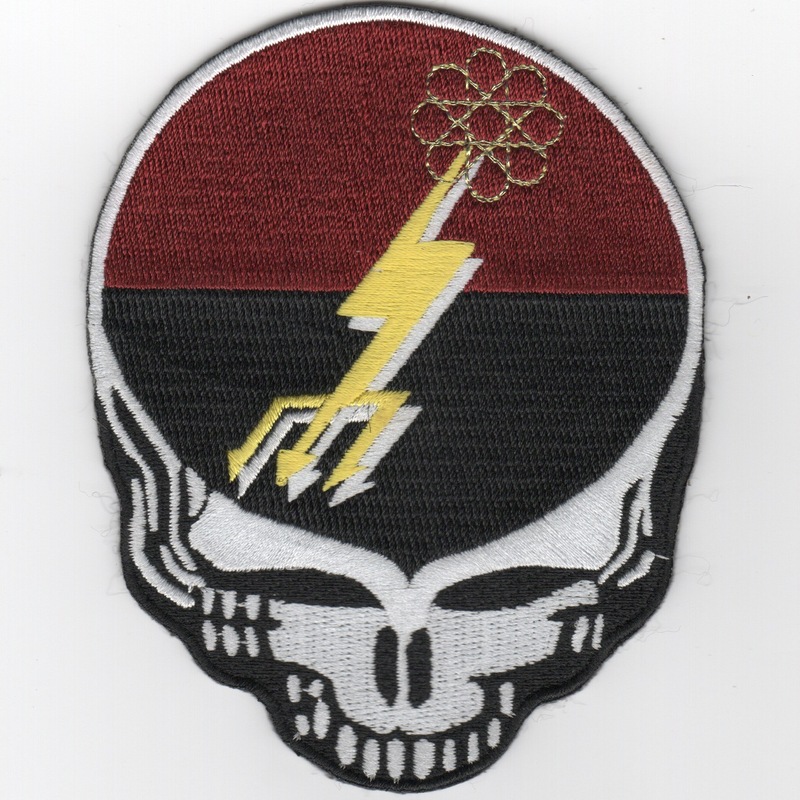 This patch is fashioned after the Grateful Dead Band skull. 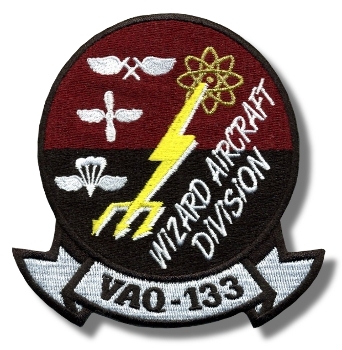 This is the VAQ-133 "WIZARD AIRCRAFT DIVISION patches. Homepage | Order VAQ-133 Patches!